Hey guys! I am a 36 year old mother of two girls, ages 4 and 2. I struggled with my weight for pretty much my entire life. At the age of 6 I started gaining weight faster than my peers. I had an unstable childhood and turned to food for comfort. I was teased about my size and told by virtual strangers that I would be “so pretty if I just lost some weight”. I can still feel the effects of these comments decades later. I actually cringe when I think of it. This lead to years of yo-yo and fad dieting. You name it, I tried it. 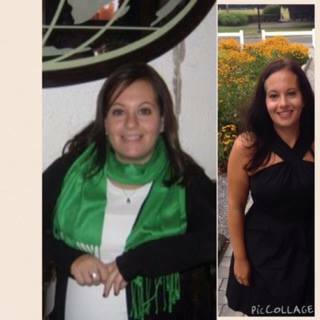 Jenny Craig, WW, Atkins, South Beach, personal trainers, marathon training (NYC 2011- I lost 4 lbs), Alli, Hydroxycut, The Cabbage Soup Diet, The Zone…and so on. It wasn’t until my wedding that I lost all of my weight (through diet and exercise) and I felt good about myself. Fast forward to the aftermath of two pregnancies and a natural disaster (Hurricane Sandy) that left me with a destroyed house and no kitchen, and an additional 60+ pounds on my 5 foot frame. I literally had no idea what I was going to do to lose the weight. I didn’t know how to do anything other than fad diets. I couldn’t manage to get to the gym with my two little ones. The older one HATED the gym babysitting and would scream her head off every time I dared to try it. The little one wouldn’t let me put her down long enough to even attempt it. When I planned to go after my husband came home from work, he would either be late or something would happen causing me to lose all motivation. I am sure I am not alone with this. A good friend invited me to join her challenge group - clean eating and 30 minute at home workouts. I remember thinking “Yeah right. There is no way this will work, but I am desperate enough to try anything”. I could not have been more WRONG. Those 30-minute workouts got me better results than I ever had, even with my $100 per hour trainer. I struggled through the program at first. I forced myself to wake up before the rest of my family so that I could get it done without them interrupting. I remember not being able to do ANY push-ups without my knees on the floor. By the end of the program I was doing multiple sets of 12 or more. It was unreal to me. Also, I finally learned how to properly feed my body, without being hungry. Food was always the BIGGEST struggle for me. Whenever I had some success with a diet, I never really learned how to keep it together in the real world. I didn’t know how to translate it to a life style change. With the help of portion controlled clean eating and Shakeology®, I finally know what my body needs to feel its best! The real key to my success was the challenge group. A private, online community of strong, like-minded people who held me accountable at every turn, and genuinely cared about my success. We shared recipes, struggles and triumphs. It really became like a family. I fell so in love with this program that I went on to do MANY others and I became a coach to pay it forward. I want to help people feel better about themselves; the way that I was helped. To me, the numbers on the scale are not what matters. It is how you FEEL that counts. If you are interested in learning more about starting YOUR journey to become a healthier and more confident version of yourself please email me at BATESQFitness@gmail.com, message me on facebook at FB.com/brooke.tanner.315 or visit my site www.beachbodycoach.com/Bat3927. I am an Independent Beachbody Coach and would love to help you reach your goals! It doesn’t matter where you are now; all that matters is where you are going!